You are at:Home»3rd Fleet»For hospital ships, deployments bring hope and partnering — but will they survive budget cuts? Mercy’s award came in the shadow of the Navy’s decision last month to cancel several ship deployments due to federal budget cuts, including that of its sister ship, hospital ship Comfort. The Navy in late March announced the Norfolk, Va.-based Comfort would not conduct this year’s “Continuing Promise,” the annual humanitarian mission to Central and South America that’s akin to the Pacific Fleet’s “Pacific Partnership.” This year’s scheduled mission would have started April 9 and taken Comfort to eight countries this spring and summer. Like prior missions, sailors and medical teams with the embarked Military Treatment Facility and other embedded nongovernmental aid organizations would have provided medical, dental and veterinarian care to local residents – surgeries and preventative medicine are among the sought-out needs during such missions – and assist with civic construction projects. 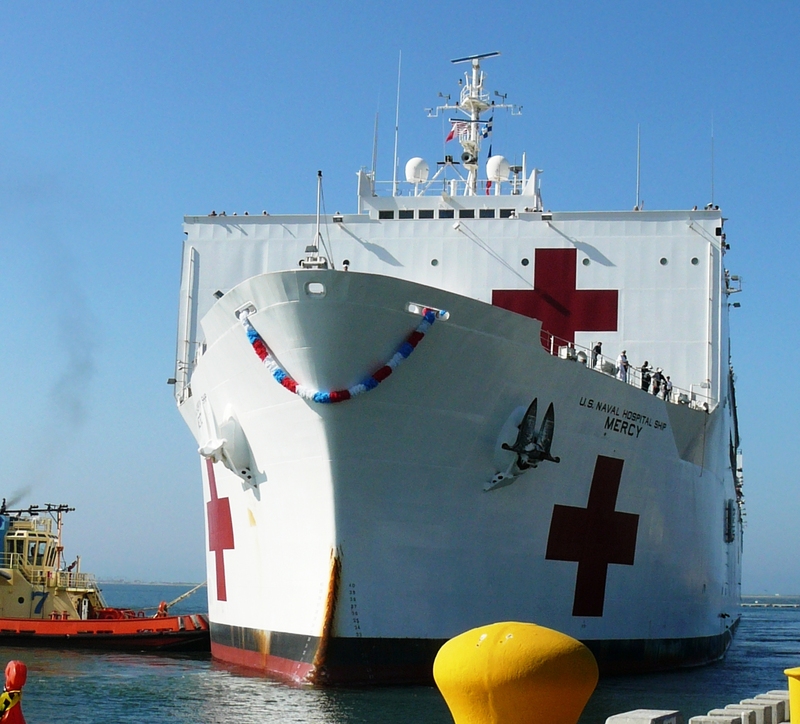 In recent years, the Navy has been deploying its two hospital ships annually, alternating with gray hulls, for the popular humanitarian missions the military sees as spreading the “global force for good” and helping allies and partners in need. Medical care is seen as the great uniter, and the Navy’s ability to step in and provide help, whether in larger humanitarian assistance missions or smaller civic action projects done by smaller forces or ships’ crews during community-relations events during liberty port calls, are seen to benefit the larger strategic picture of engagement, presence and, frankly, spreading goodwill. That help is particularly welcomed in the more remote places of the South Pacific and South Asia, where storms, tsunamis and other natural disasters have damaged infrastructure, particularly in coastal areas. When they left the ship, Mercy’s teams worked in remote areas, including parts of Indonesia with few modern conveniences and they sometimes encountered locals who rarely if ever see Westerners, let alone a big white ship. “To see it in person makes a big impression. It can have a potential of sending a message of support and of hope,” Hinman said. At one point, Mercy ventured north to Vietnam, a notable stop for many veterans aboard the ship. “I almost went there 40 years ago, potentially as a combatant,” said Cogar, who had enlisted as a hospital corpsman in 1972. This time, though, Mercy brought along a high-tech laser treatment system that now is being shared to help with critical care. 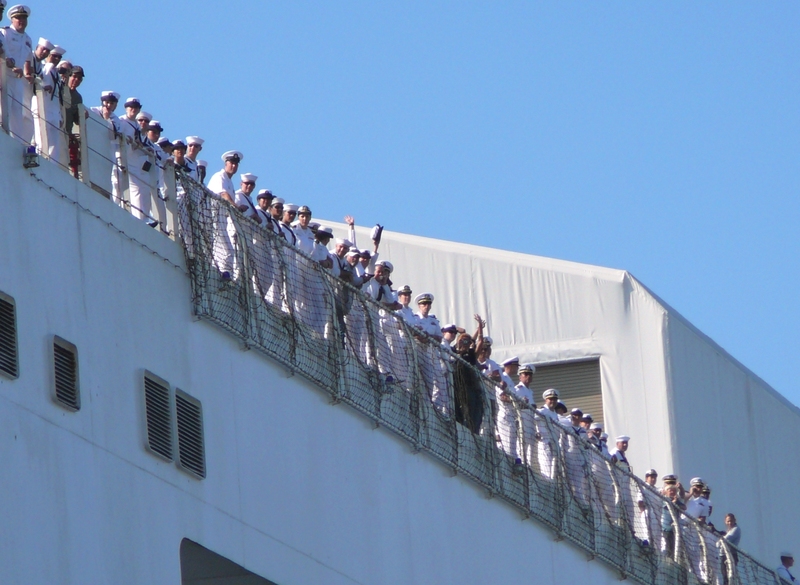 Sailors and civilians “man the rails” for Mercy’s return from its 2008 deployment. The humanitarian missions remain popular with medical personnel as well as NGOs. “People are standing in line to come aboard this vessel,” Hinman said. “People really want to be here. It’s really positive and exciting.” Life aboard the ship, an 894-foot converted oil tanker, can get a little crowded, particularly to those unfamiliar with living at sea, working seven days a week in often hot and humid environments. “It’s not a traditional gray hull ship,” Hinman said, noting civilian mariners keep the ship running. “Teamwork is important. Safety is important,” said Command Master Chief (FMF/SW) Thomas Twigg, the MTF’s senior enlisted adviser. “There’s a lot of sailors that have never been out on gray hulls.” And like many civilians, soldiers and airmen find time on Mercy is unlike any deployment they’ve done. “It can be a little bit of a shock in the tight spaces in berthing,” Twigg said.